Content by Tony Macklin. Originally published on July 3, 1976 @ The Journal Herald. Robert Altman and crew have done the necessary reorganizing and reediting on Buffalo Bill and the Indians and have created a terrific movie out of the troubled dust of what was. The first time I saw the movie in New York, it was explicit, contrived, and needed a lot of help. In the May 8 Journal Herald, I reported attending a large press conference with Altman and Paul Newman. I asked Altman whether the film would have any changes in its ending, and he responded unqualifiedly that it absolutely would not. I felt like a reporter being debriefed by Nixon. Fortunately I didn't believe Altman. I predicted that the last part of the movie had to be changed and would be changed. It couldn't stand as it was. The material was there, but it wasn't in the right form yet. Altman has made the necessary changes: he has moved Buffalo Bill's soliloquy to the end, and now it has impact it never had in the earlier version. He follows it with a Wild West Show skit that is a battle between Bill and an Indian pretending to be Sitting Bull, which makes an effective finale because it represents what the picture stands for. A shot of Sitting Bull's beads and a cross no longer ends the film; it comes earlier and is more subtly persuasive. And, blessedly, the one-dimensional line "Who the hell gives a damn anyway," which ended the first version has been cut. Buffalo Bill and the Indians, at the Cinema South and Salem Mall, is now a totally different film and a great one. It is ambiguous, haunting, and resonant. It is opened up, no longer safely limited. It is now an Altman film. The key to the movie is that Altman and his brilliant writer Alan Rudolph are saying that image is not reality. The show that image -- what appears to be -- is misleading and leads us away from reality. Every line and situation seems to come from this idea. This lines and situations are full of irony and humor. In a movie in which so many of the lines are quotable, I'll quote just a few. The journalist says of Sitting Bull, "If he wasn't interested in the show business, he wouldn't have become a chief." Halsey, Sitting Bull's "interpreter," comments, "Sitting Bull says history is nothing more than disrespect for the dead." Buffalo Bill, about to track Sitting Bull, cries out, "Goddam it, where's my real jacket?" President Cleveland says, "The chief is a wonderful comedian." And as Bill walks away in his showy jacket the president in awed appreciation says, "It's a man like that that made our country what it is today." Talk about irony! 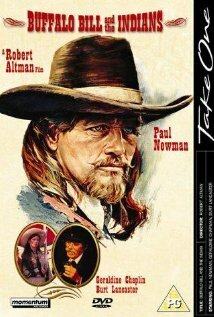 Buffalo Bill and the Indians -- loosely based on Arthur Kopit's play Indians -- is the story of how Bill Cody (Paul Newman) is ruled by his image as a star. When he buys the services of Sitting Bull (Frank Kaquitts) to join his Wild West Show, Bill is perplexed, then obsessed, by the mysterious Indian. Chief Sitting Bull has a spiritual life; Buffalo Bill is all image and doubt. For Buffalo Bill, trying to catch reality is like trying to shoot a tiny, elusive bird. Near the end of the movie, Bill hallucinates, sees Sitting Bull in various places, and tries to rationalize about stardom. He says to Sitting Bull, "I've got nobody to talk to -- and you're not even there." It is hard to stop writing about the scenes and themes of the film because it is so rich in them. In the world of large figures like President Cleveland, small men, like the president's speech writer and Nate Salsbury the producer of the Wild West Show, run things. Sitting Bull is a small man. Little people are big business. Other peaks of irony and sly humor are that Bill is scared of a little bird, that Annie Oakley's assistant is shot by her and people think it is part of the act, and that listeners to an opera singer have different reactions, from Bill's lust, to the president's boredom, to Salsbury's tears at the show business. Buffalo Bill and the Indians comes down to two speeches by the legend maker (Burt Lancaster). In the first he says, "That's why stars spend so much time in front of the mirror, seeing if their good looks and word delivery can overcome judgment ... Once a star like Buffalo Bill Cody makes a judgment, it becomes a commitment." Later the legend maker says, "Buffalo Bill could only trust his senses. And when his senses fail, he just might see things the way they really are." The cast of Buffalo Bill and the Indians is ideal. Paul Newman, with the help of some good editing, is very effective as the star whose points are beginning to turn inward. Frank Kaquitts and Will Sampson are tremendously evocative as Sitting Bull and his interpreter. Burt Lancaster is solid as the wise legend maker. Joel Grey is energetic as the producer, and Harvey Keitel gives a nicely shaded performance as Bill's fidgety nephew. Also adding to the overall rightness of the ensemble are Geraldine Chaplin, Kevin McCarthy, and Pat McCormick. The production values are imaginative and memorable. The photography which features browns and yellows -- little blue -- by Frank Lohmann, the vivid production design by Tony Masters, and the brash music by Richard Baskin all are excellent. Altman successfully continues to refine overlapping sound techniques. The script by Alan Rudolph and Altman is a gem of irony. One the scene where the audience applauds the dignity of Sitting Bull seems strained. One ironic note. Dine DeLaurentiis, who presented Buffalo Bill and the Indians and is producing Ragtime, fired Altman from the latter supposedly because Altman didn't make enough changes in Buffalo Bill to make it commercial. But remember Dino D. was the executive producer for Lipstick which shows where his taste is. The changes Robert Altman did make in Buffalo Bill and the Indians have made it a work of art. The changes have breathed life, unity, and vitality into a work that didn't have them. Even though Robert Altman is not a truth teller in public, his work has the greatest truth. It is honest and magical.